The total market size for organic packaged food and beverages in New Zealand in 2017 is US$130.8mn, making it the 21st largest market in the world by value. Per capita spending on organic packaged food and beverages in New Zealand is US$27.60, which ranks as the 15th largest spending per capita in the world. The largest company by sales in organic packaged food and beverages is Fonterra Co-operative Group, which maintains 12.4% of total sales. It is followed by Wilmar International Ltd and Jacobs Douwe Egberts. Organic packaged food and beverages in New Zealand will see strong year-on-year growth of close to 10% in 2018, which is nearly double the growth rate projected in the total Australasia region. New Zealand maintains a market size for organic packaged food and beverages of US$130.8mn in 2017, which is 0.3% of global category sales. Within the Australasia region, only Australia surpasses New Zealand in total value sales of organic packaged food and beverages. New Zealand will experience strong forecast growth of sales of organic packaged food and beverages, at a 9.3% CAGR from 2017–2022. Organic packaged food and beverages are typically positioned as premium in NewZealand, but the increasing penetration of private label products is putting downward pressure on prices. There is no legislated regulatory certification system for organic products in New Zealand. Products can become “certified organic” by adhering to international standards for production, processing and marketing. However, New Zealand’s government has indicated that it may institute a mandatory certification regime in the future. New Zealand consumers increasingly consider organic products to be safer and healthier than conventional products, which is contributing to sales growth along with new product launches. Organic food and beverages are positioned as premium products in New Zealand, but the increasing penetration of private label products is putting downward pressure on prices. Organic dairy and organic non-cola carbonates have seen some of the highest sales value growth rates among the organic packaged food and beverages categories in recent years. 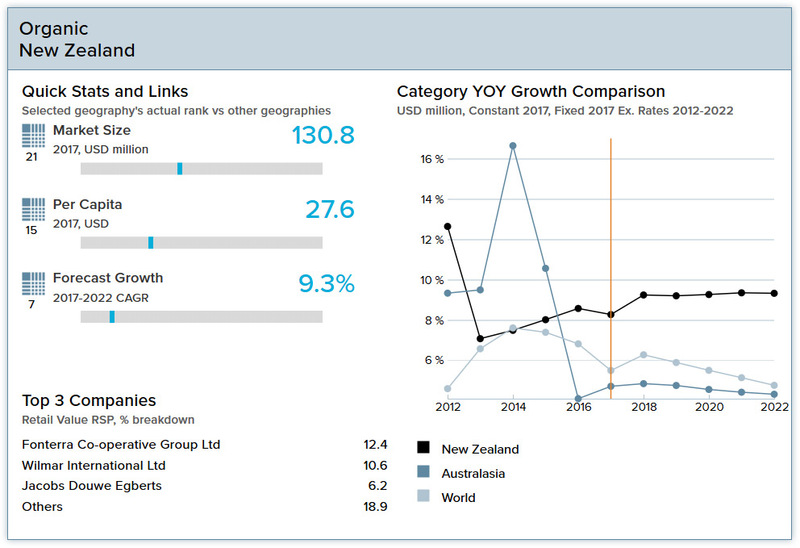 The organic packaged food and beverages landscape in New Zealand is fragmented and growing more competitive. The New Zealand-based dairy company Fonterra Co-operative Group Ltd was the market leader in 2017 with a 12.4% value share, followed by Singapore-based Wilmar International Ltd with 10.6%. Private label products accounted for 3.6% of sales value in 2017, up from 3.5% in 2016 and 1.1% in 2012. Organic packaged food and beverages are projected to continue recording strong growth in the near term, driven by consumers’ increasing health and wellness concerns and new product launches. The major factor affecting the market in recent years would be the establishment of a mandatory organic certification scheme, should the government choose to do so in coming years, potentially affecting the ease with which products can be labeled as organic and the overall shape of the market. Among organic packaged food categories, dairy is projected to register particularly strong sales value growth in coming years, and coffee is projected to grow at one of the fastest rates among organic beverages categories. New Zealand consumers are increasingly interested in product contents, and prefer naturally derived ingredients. Sugar continues to be seen as a less desirable ingredient in many products, including beverages. Artificial sweeteners are falling out of favor in light of media reports about their potential negative health effects, and consumers are increasingly demanding natural sweeteners as alternatives to sugar. New Zealand’s economy is slowing but will continue to grow at a healthy pace. Real GDP increased by 3.5% in 2017 and growth of 3.1% is expected in 2018. Steady gains in private final consumption, strong migration inflows and a healthy export sector are driving growth. Inflation was 1.9% in 2017 and is projected to remain at the same rate in 2018. Unemployment was 4.8% in 2017 and will fall to 4.7% in 2018. New Zealand’s population reached 4.7 million in 2017, an increase of 890,000 since 2000. The median age is projected to rise from 37.1 years in 2016 to 39.2 years in 2030. Net migration is a major driver of population increases, with one-quarter of New Zealand residents born overseas. 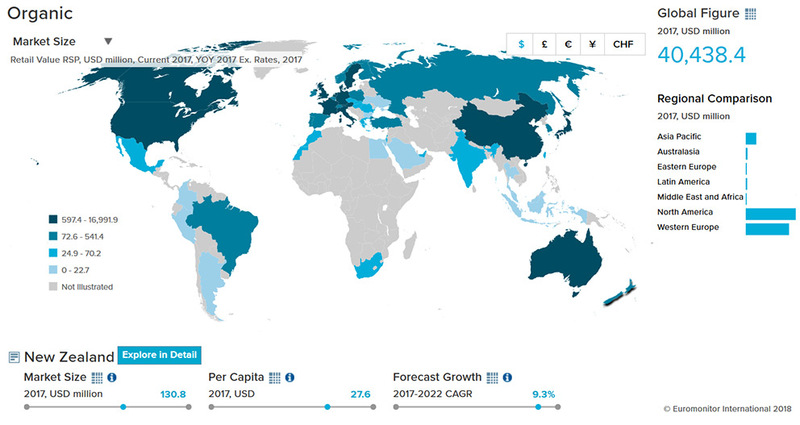 In 2017 per capita consumer expenditure totaled US$22,824 and is projected to grow by 1.3% in real terms in 2018. Per capita disposable income in 2017 was US$22,027 and is projected to grow by 1.4% in real terms in 2018. Education will be the fastest growing expenditure category through 2030, followed by clothing and footwear. 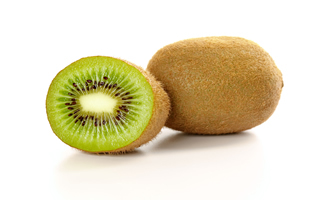 New Zealand has a voluntary standard, developed by Standards New Zealand, with certifiers measuring whether a product is organic either against this or (more commonly) against stricter standards set down by their own organizations. Organic products imported for sale are controlled through the Fair Trading Act, which requires truthful and non-misleading representations of the products, and a way to demonstrate that an organic product was produced organically. Importing organic products for use as ingredients in products which are then exported under the Official Organic Assurance Programme (OOAP) must be certified organic by an appropriate body and be able to be verified as organic, and the importer must be registered with a recognised Third Party Agency (TPA). New Zealand Food Safety Authority keeps list of certification agents and other organic organizations. Joint Accreditation System of Australia and New Zealand (JAS-ANZ). The US and New Zealand have a recognition agreement, which allows New Zealand to accredit certifying agents in its country. On the third country list of the European Union.